Randy Winn burst from the shadow of relatively obscurity with a game winning three-run blast that broke a 1-1 deadlock in the fourth inning. Winn’s homer was only his second hit of the season, but could go along way toward garnering him more playing time in the absence of Curtis Granderson. More importantly, it was the climax of the Yankees only run scoring rally and provided all the runs that C.C. Sabathia would need. Despite throwing 67 of 106 pitches for strikes, Sabathia wasn’t as sharp as usual in the early going. In the second inning, he gave up an impressive opposite field home run to Matt Wieters on a fastball up in the zone, but was still able to keep the Orioles’ hitters off balance with a nice mix of all of his pitches. Thanks to an effective slider and change, Sabathia continued an early season trend of keeping his infielders busy. Including double plays, 16 of the 24 outs recorded by Sabathia were on the ground. Coming into the game, Sabathia’s ground ball rate was a career high 53% of balls put in play, so tonight’s effort will only add that. 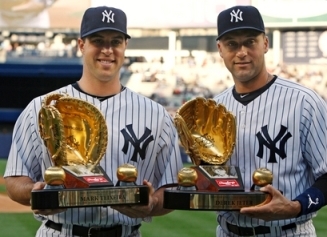 Derek Jeter and Mark Teixeira were presented with their 2009 Gold Glove awards in a pre-game ceremony. For the first three innings, Jeremy Guthrie was actually outpitching Sabathia by using the same approach of mixing his entire arsenal of pitches (and notably hitting his spots instead of Yankee batters). In the fourth inning, however, he ran into trouble, thanks in large part to a sure double play ball off the bat of Jorge Posada that was mishandled by Ty Wigginton. Although not an easy play, a more experienced second baseman would have easily turned the twin killing against the slow-footed Posada. Forced to get an extra out, Guthrie gave up the lead on a long single by Nick Swisher that just missed clearing the right field wall. Brett Gardner then followed with a single before Winn wrecked Guthrie’s night by sending a 1-0 fastball deep into the right field seats. Once he was given the lead, Sabathia relied more heavily on his fastball to plow through the Orioles’ lineup. In fact, the only real opposition he encountered from that point forward was from home plate umpire Bill Hohn. Sabathia’s game long frustration with Hohn’s strike zone temporarily came to a head when the big lefty visibly gestured toward Hohn during a seventh AB against Lou Montanez. Sabathia wound up walking the hitter on what YES analyst Al Leiter termed an “angry fastball”, but the big man quickly regained his composure and breezed through the eighth inning. Despite the win, tonight’s game was not without its dark clouds. Before the top of the sixth inning, Jorge Posada was removed the game with what was called tightness in his right calf. Posada was sent to the hospital for an MRI, but no further details were disclosed. Also raising an eyebrow was the use of Joba Chamberlain to close out the 4-1 victory. After the game, it was revealed that Mariano Rivera has been suffering from minor tightness in his left “flank”. In a post game interview, Rivera did not seem concerned by the injury, but the absence of Enter Sandman in a save situation must have been very discomforting to Yankee fans. C.C. Sabathia is now 11-1 against the Orioles, including a current six game winning streak. Jeremy Guthrie is riding a six game losing streak against the Yankees. Sabathia has pitched at least 6 2/3 innings in 31 of his last 37 regular season starts. Joba Chamberlain’s save was the second of his career and first since September 23, 2007. After beginning the season with only 1 hit in his first seven home games, Nick Swisher has recorded 8 base hits in his last three. Swisher has also recorded an RBI in each of those games. In his Yankees home career, Swisher only has one other three game stretch with at least two hits as well as one other three game stretch with at least one RBI. Robinson Cano failed to reach base for only the second time all season (April 17 vs. Texas). Gene Monahan was present in the Yankees dugout during the game. Monahan, who has been battling throat cancer, is slowly working himself back into the role of full-time trainer. “Randy, he helps the Yankees Winn” was unveiled as John Sterling HR call for the Yankees left fielder.